The Twist banner system has been designed to create virtually any shape exhibition stand you require. The sleek and attractive Twist banner system features silver coated steel bases with a minimal footprint and the unique ability to bend and flex to any angle. This allows you to create an impressive and versatile exhibition display. The only limitation with Twist is your imagination. Compared to other banner systems Twist far exceeds. The level of quality is backed by a life time manufacturer’s warranty and has been designed and built to last. Here are just a few more reasons why you should choose Twist as your exhibition display. When planning any exhibition, you always need to consider who will be assembling the stand. With Twist, anyone can do it. The simplicity of the Twist flexible display system allows for quick and easy assembly, whether you have one twist banner or multiple banners and accessories linked – Twist is simple and easy. 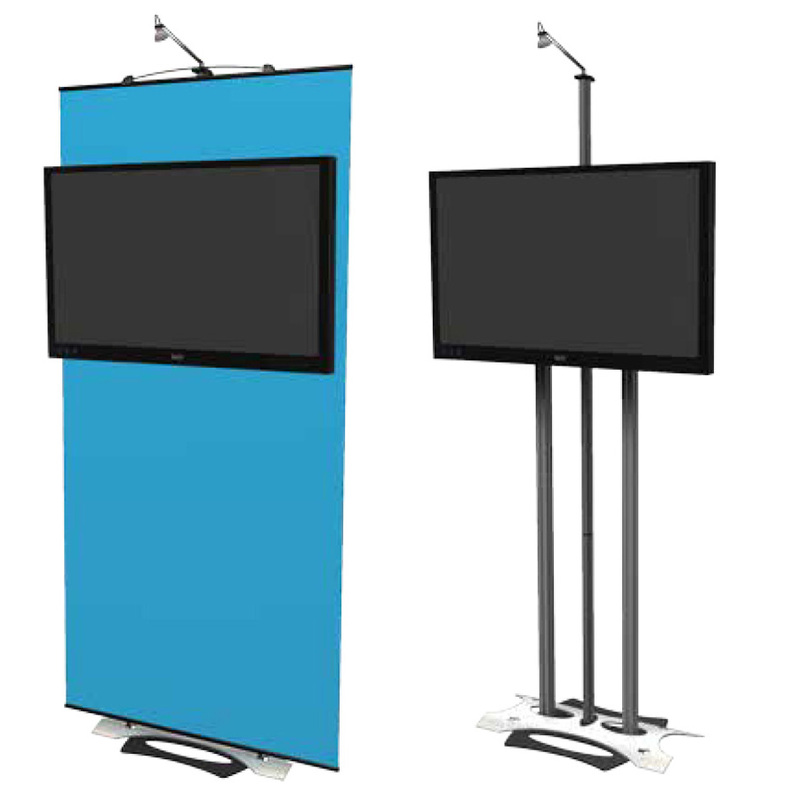 The durable steel bases provide the support for the whole display system. The lightweight aluminium uprights slot into the base securely and twist and lock together to create a sturdy frame. The top of the graphic simply hooks on to the top of the upright, and the bottom of the graphic slots into the circular holes in the base. This creates your Twist banner. The Twist flexible display systems are made up of singular Twist banners that are available in a wide range of sizes to suit individual needs. Choose from 700mm, 800mm, 900mm and 1000mm wide and 2000mm, 2250mm and 2700mm high. The banners can be linked together to create a large format display. There are two linking options which enable you to join multiple banners together. The easi-link kit allows you to create a straight line of twist banners. The kit includes two dowel pins and three magnetic bars. The dowel pins join the banner graphics together at the top and bottom and the magnetic bars align the graphics from top to bottom – creating a seamless finish. The flexible option is the flexi-link kit. This enables you to join multiple banners together, bend and flex the Twist system without compromising the seamless graphics. It includes a printed graphic which is 550mm wide with flexible finishing strips at the top and bottom. This enables you to join a banner to each side of the 550mm wide linking panel. The six magnetic bars are located down the back, three on each side. With the magnetic bars in place the Twist system can now be bent and flexed to configure to any shape. The Twist range includes a range of accessories which allow you to create an impressive exhibition stand. Create a professional meet and greet point for you to welcome customers on to the exhibition stand with the Twist counter. Complete with a graphic wrap for additional marketing space, and you can choose to add an internal shelf for extra storage. Add LED spotlights to illuminate your artwork and ensure your marketing message is not missed. The Twist wheeled hardcase is ideal for storing and transporting your Twist system. It provides ample space and can easily hold two Twist banners with graphics. Just add a single case or double case conversion kit and transform the Twist banner hardcase into a promotional podium with extra space to promote your brand. The Twist shelf is ideal for holding lightweight marketing material and makes a nice addition to any Twist banner display. 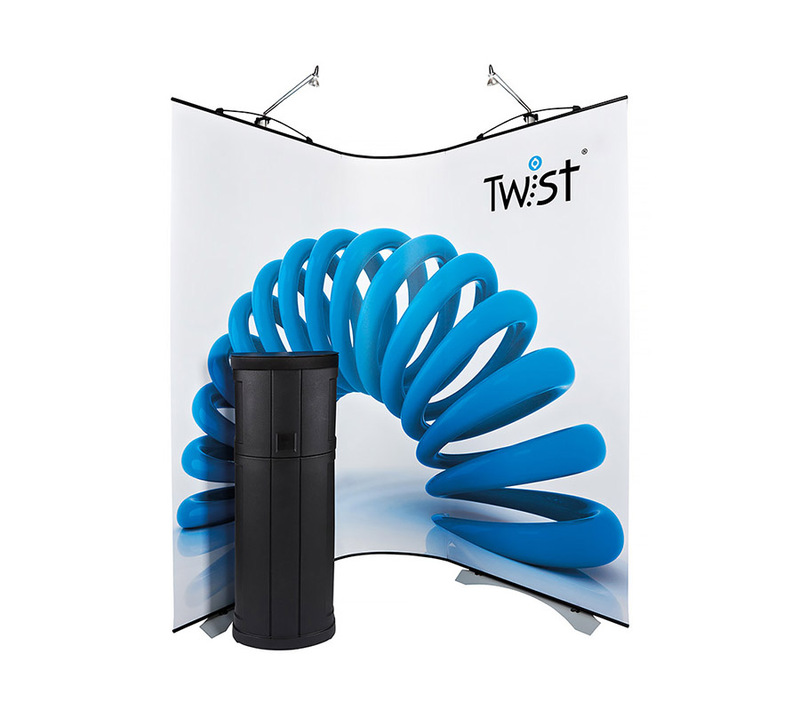 The Twist range includes the ability to add screens to your exhibition display. With the digital world that we live in, its important when exhibiting to provide your visitors with a stimulating and interactive experience, this will allow you to engage them for longer on your stand. The Twist AV stand can hold screens up to 50 inches. This provides you with a large advertising space which you can use to promote a professional show reel or PowerPoint presentation. It can be used in conjunction with a 1000mm wide banner and provides a stable mount for exhibiting. The iPad mount is ideal for showcasing other aspects of your business via your website. An iPad can be locked to your website and allow visitors to browse the rest of your business. It can also be great for data capture. The Twist media banner comes with a media kit as standard which allows you to mount screens up to the weight of 7.5kg. The Twist banner hardware features an extra stability foot on the base, this means this banner stand will remain sturdy even on difficult and uneven floors. The great thing about Twist is it can be treated as an invaluable investment to a business. When investing in a Twist banner system you are investing in the future and growth of a business. The Twist system can grow alongside a business and change with future marketing needs. It can be added to at a later date, and you will never outgrow your Twist banner system. It can be stripped right back and used as individual banners for smaller, more intimate events, or you can link multiple banners together to create a spectacular and unique exhibition display. Even if a re-brand is on the horizon for your business, you can keep all original hardware and simply replace your graphics. Our replacement graphics are printed to a photo quality and are competitively priced. 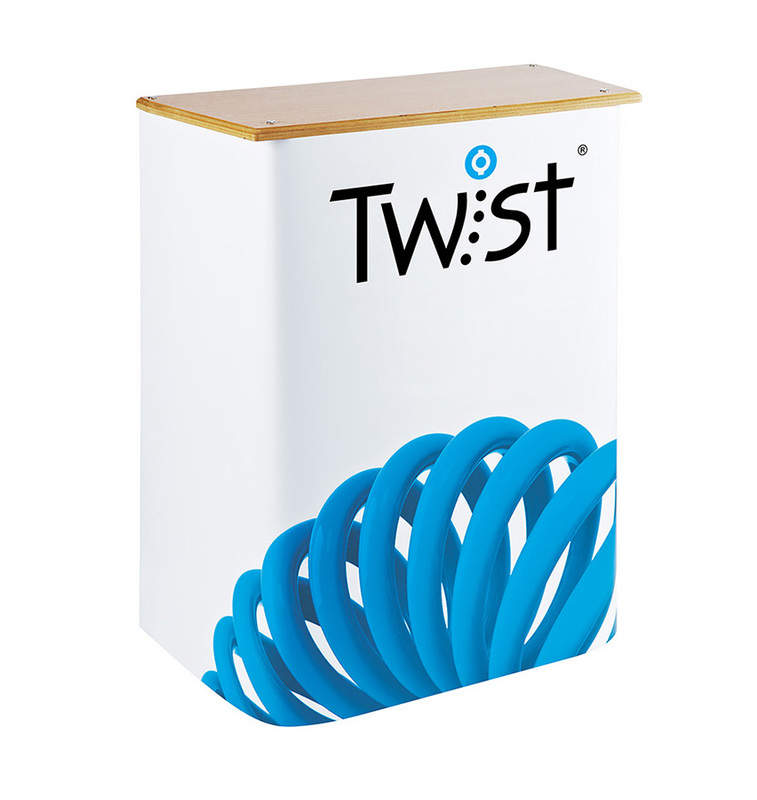 Twist is the ultimate, flexible display stand for exhibitions and events and is one of the most flexible, portable, modular exhibition display systems in the world.